Is Wearing A Hat Also Another Reason For Hair Loss? Of course not. You may wear anything on your head, it will not lead to a hair loss. Actually, hair loss occurs due to a variety of factors out of which genetics is the most predominant. While people blame it on the exposure to sunlight, hair styling products, some blame it on the hat. The fears are completely unfounded as a hat is not accountable for any kind of hair loss. While the hat may not be to blame, we can go into the finer details of hair loss. But there are certainly other measures that you may take to curb hair loss. It depends entirely on how genetically predisposed you are to the problem of hair loss. The other factors that might be causing havoc on your hair growth can range from a nutritionally deficient diet, an unhealthy lifestyle to hormonal imbalance. The ultimate last resort to extreme hair loss is hair transplant. What Actually Causes Hair Loss? Blame it on your genes or the hormones acting up. Male pattern baldness is primarily caused by DHT or dihydrotestosterone. It’s a hormone that is created as a natural by-product of testosterone.DHT is closely related to the development of male facial hair and sexual characteristics. But it may cause quite the opposite effect during the later years. A person who is genetically sensitive to DHT will tend to lose hair as it causes the hair follicles to miniaturize. Scientifically speaking, DHT binds with the hair follicles and causes a decrease in their size. It leads to a lack of growth of follicles thereby causing hair loss. Yes of course. You may be facing hair loss due to other factors like a poor diet or sedentary lifestyle. 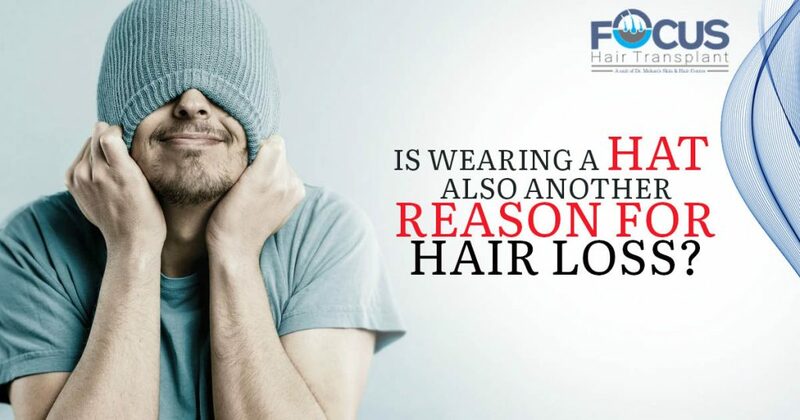 But these factors lead to only temporary hair loss. In such cases, hair loss can be reversed by mending our bad habits. Alterations in the diet to balance the nutritional deficiency and adopting an active lifestyle will work wonders in this case. But wearing a hat is not good for your hair, either. Now, don’t pop your eyes out thinking that we have made a turnaround. True, it won’t cause hair fall. But it does spell trouble for your scalp and hair. How? We will let you know. It affects the overall appearance of hair as it can cause problems for your scalp.considering that you prefer to wear it all around the hot, humid conditions of the summer season, your scalp might get irritated with excessive water it has to soak up. Those who wear a hat that is too tight will cause irritation to the scalp due to constant rubbing. So if you love wearing hats, shampoo often so that your scalp remains clean and dry. So What Can I Do To Prevent Hair Loss? If you can’t give up wearing a hat, it is best to maintain hygiene in your hair. It will be better if you try out the new DHT blocker shampoos which curb hair loss as well as help in maintaining the cleanliness of the scalp. So throw caution to the winds and don’t ditch your hat. Wear it with elan but don’t forget to take good care of your scalp. Remember that what you wear is not going to affect your hair, but what you do is definitely going to.